I can't believe I've never included "Tell Him" as a Music Monday selection before. This girl group song from 1962 is one of my all time favorite songs. 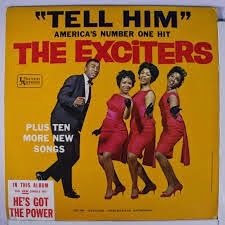 The Exciters were a girl group from Queens, New York. Brenda Reid, the lead singer, suggested adding her husband, Herb Rooney, to the group, and he joined them on most of their popular songs. Legend has it that "Tell Him" is the song that inspired Dusty Springfield to sing pop/soul music. This video, filmed at a zoo, is great fun! I love everything about it - the dresses, the gloves, and especially the music. I'm with you, Trish! I love everything about this song and singing group. I could listen to songs like this all day (and some days I DO!)Ha! Mary, me too! I love girl group music ... retro soul ... and 1960's oldies!